Abstract: The design and analysis of over-current protection for telecommunication DC power systems can be greatly assisted by the use of a computer-aided simulation tool. This article reports on the development of a fuse model for SPICE derived software that can accurately represent characteristic fuse parameters. The fuse model can also be adapted to represent the operation of circuit breakers. The design and analysis of over-current protection for telecommunication DC power systems can be greatly assisted by the use of a computer-aided simulation tool. However, a simulation is only as accurate as the component models and element values used to represent the real world. This article reports on the development of a fuse model that can accurately represent fuse characteristics. 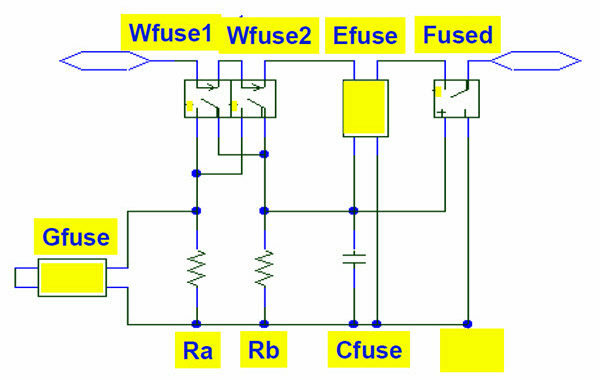 The fuse model can also be adapted to represent the operation of circuit breakers. The performance of over-current protection devices significantly affects both the reliability and safety of the DC power system. Voltage excursions resulting from the operation of a fuse during a short circuit can cause electronic equipment malfunction due to over-voltage, and disrupt service due to under-voltage. Poor discrimination between protection devices can cause upstream device operation, resulting in major interruption to service. The rapid advancement of both computing power and analogue circuit simulation programs derived from SPICE software provide a user-friendly environment for over-current protection design and analysis. This environment is advantageous as telecommunications power distribution systems are often large and complex, and developing an equivalent circuit model for apower system is not a trivial task. The analysis of DC distribution systems using computer simulation has been shown to provide fair agreement between simulated and experimental results [1,2,3]. However, the fuse models developed have not been able to accurately represent fuse characteristics. 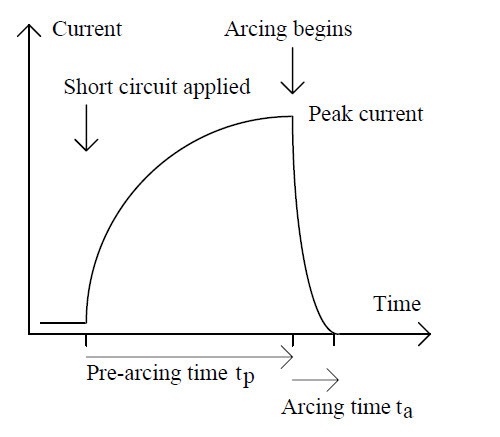 Typical parameters for a fuse operating in a circuit with a given time constant and prospective current are rated current ir, peak current ip, pre-arcing time tp, arcing time ta, total operating time tt= tp + ta, pre-arcing i²t (i²t)p, arcing i²t (i²t)a and total operating i²t (i²t)t= (i²t)p + (i²t)a. Figure 1 illustrates some of these parameters. The prospective current for a circuit is the maximum current that would be reached if the fuse did not operate. The i²t or current-squared time rating is a commonly used fuse characteristic when operating current levels are much higher that the rated fuse current ir. The circuit time constant defines the ratio L/R, where L and R are the effective circuit inductance and resistance components in series with the fuse and energy source. A fuse model is developed in Section 2 and model validation is undertaken in Section 3. Section 4 discusses the development of other DC power system component models for application to the analysis of over-current protection, and the paper is summarised in Section 5. Posted in OrCAD PSpice and tagged DC Distribution Systems, fuse simulation, OrCAD, over-current simulation, PSpice, SPICE fuse model.